We have been successful in making our presence felt in the market by offering the wide range of Temperature Controller to our respected clients. The provided controller is an instrument used to control the temperature. 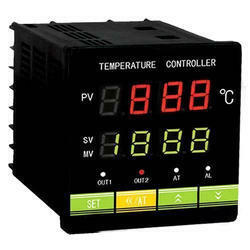 This controller receives the signals and control heater and other devices to maintain the desired temperature. We are one of the foremost providers of Temperature Controllers. Professionals’ using optimum quality raw material, which is procured from trustworthy dealers of the industry, designs these products. Products obtainable are extensively demanded by respected clients due to longer performance life and premium finish. Our firm is widely known for trading a superior quality ambit of Temperature Controller. Supported by our technological expertise and diligent workforce, we are capable in manufacturing and supplying a comprehensive array of Temperature Controller. These are made from the best quality raw material which are obtained from the authentic vendors. our entire range of products is offered as per industry.. External temperature controller interface allows compensation for low-speed applications and varying input temperatures.